(Newser) – There's catching a thief on surveillance camera, and then there's this bizarre incident out of San Antonio, Texas. 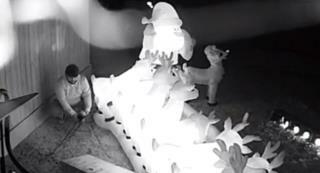 Homeowner Kan Lamkin woke on Christmas morning to discover that somebody had stolen his 16-foot inflatable reindeer-themed decoration, reports WFAA. The problem for the still-unidentified thief is that the whole 5-minute caper was caught on video. First, Lamkin made large black-and-white photos of the thief and mounted them on cardboard on his front lawn. Then he set up a projector and began replaying the theft over and over, set to a familiar holiday tune. To bad he didn't get electrocuted. Cameras everywhere. I have two in my home. With Facial recognition software, thieves are going to have a tough time. When he is done with it, after the new years.